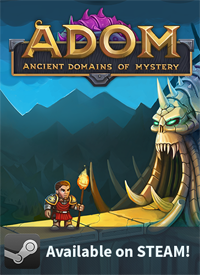 Almost directly on the heels of ADOM 2.3.0 follows ADOM 2.3.1. 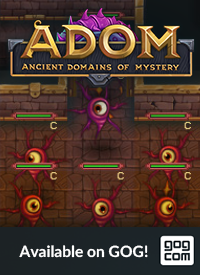 As expected ADOM 2.3.0 was a pretty experimental release and contained... err... well... a number of issues and room for improvement ;-) And so we repaired and improved. The changelog is pretty impressive again although it's mostly fixes and fine-tuning (87 official tickets and more stuff going on behind the scenes - the result of almost 72 hours of frantic work behind the scenes). 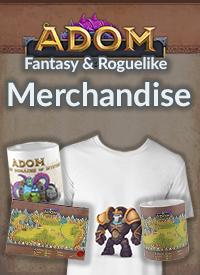 We are particularly grateful to Grond (master bug hunter who almost single-handedly killed every bug existant in the release), but also to Laukku, Ben Mathiesen und Qui from the forums. Your help was invaluable (and thanks also to everyone else who contributed). I also have to thank Jochen once more for being an undaunting force of bug destruction - great teamwork! So without further ado we dearly recommend that you download the latest ASCII-only prerelease from the usual location. Depending on how many more issues are found we now move towards finishing the graphical version. Sweet! What would be the ETA for the Steam version deployment if things go mostly as expected? Grond needs his own artifact if he's that bugsmashy... perhaps a hammer to deal with those killer bugs in the bug temple?